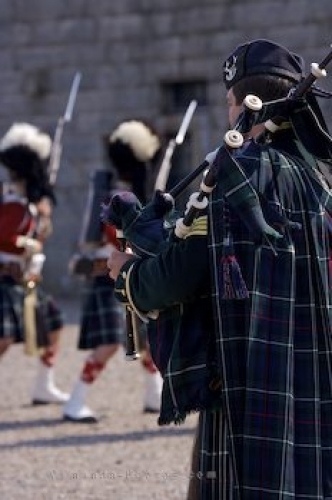 As the troops march into position for a rifle and bayonet demonstration at the Halifax Citadel National Historic Site in Nova Scotia, Canada, a bagpiper plays for them. The troops are clad in their full uniform with red jackets, while the bagpiper has a slightly different type and color of uniform. This event only takes place on certain days, so be sure to check the schedule of events if this is one of the highlights you want to see while visiting the Halifax Citadel National Historic Site. Bagpiper playing for the troops arriving in procession for a Rifle and Bayonet demonstration at the Halifax Citadel National Historic Site, Halifax, Halifax Metro, Nova Scotia, Canada. Picture of a bagpiper and troops at the Halifax Citadel National Historic Site.